Cintiq Pro 16 Stands eta? Is there any eta when the advertised Cintiq Pro 13/16 stands will be available? Or does anyone know a working alternative? The Art is Soul Freestyle Stand seems like an option.. but it's backside is entirely closed, which may cause issues with the ventilation.. also it seems to be a bit .. too small. Re: Cintiq Pro 16 Stands eta? We apologize to customers for the late availability of the Wacom MobileStudio Pro 13”/16” and Cintiq Pro 13”/16” stand. We understand your frustration with the stand not being available for shipment with the product. It’s no excuse, but the delay has been caused by technical issues. We want to ensure that we have a stand that is functioning correctly. We’ve made significant improvements over previous generations. It will be lighter, stronger, and more reliable! If you would prefer to no longer wait for our stand, please check out the reasonably priced Kensington Model K60112AM. The stand works well with our MobileStudio Pro and Cintiq Pro products. thank you for the update- seems like wacom is being much more proactive in addressing comments to these forums lately. will try to wait a little longer in hope that sooner or later a stand will be released. Long session really can become uncomfortable as my hacked/abused footstand is not steep enough... plus.. it looks so ridiculous. wacom4 wrote: We apologize to customers for the late availability of the Wacom MobileStudio Pro 13”/16” and Cintiq Pro 13”/16” stand. We understand your frustration with the stand not being available for shipment with the product. It’s no excuse, but the delay has been caused by technical issues. We want to ensure that we have a stand that is functioning correctly. We’ve made significant improvements over previous generations. It will be lighter, stronger, and more reliable! Here we are, nearing the end of November and still no stand. Has Wacom just given up on it? did something happen so far? Maybe I missed some breaking news? The product itself is still advertised to have separately sold accessories.. one of them is a three-position adjustable Wacom stand. We understand that many of you are frustrated with not having a stand available in a timely fashion. The delay is due to technical issues. We do not want to ship the stand until it is functioning correctly. The new stand will be significantly improved over previous generations. It will be lighter weight, sturdier and more reliable. We will have a stand available by Summer 2017. Are there any plans to actually release a stand for the Cintiq Pro 16, or is this product already considered EOL right after release? Some competitors even include a screwdriver to mount their included stands, which probably would be in Wacom-Terminology a 60USD "innovative accessory". Official words state the MSP16 Stand is NOT compatible with the CintiqPro16, some users claim otherwise, worth finding out but not by paying another 100 bucks...feedback welcome. yay for JUNE 2018 and still no stand for my wacom pro 16 that I paid 1500 dollars for that was supposed to have a stand available over a year ago. "Wacom Stand Cintiq Pro (for 13 and 16)"
It wasn't listed on any snapshots (webarchive is your friend) until October 2018, so it is safe to say we waited almost 2 (two) years for a, from the beginning advertised, stand to appear. All trolling put aside... and I am honestly asking if Wacom is considering to offer a discount for those who owned the Pro 16 for over a year? Doesn't need to be much.. just some customer appreciation for waiting THAT long.. 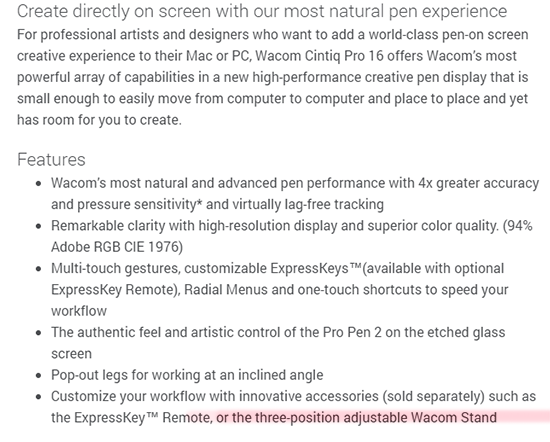 I'm on the Wacom-wagon since the Intuos 3 got released...but I have not seen such a mess elsewhere with the delay excuses (and ignoring any further mentioning of it) as with the Cintiq Pro 16 stand. There are no planned promotions or discounts for the stand as far as we know. People are reporting that the Mobile studio stand and the Cintiq pro 16 stands are compatible. Is that true? 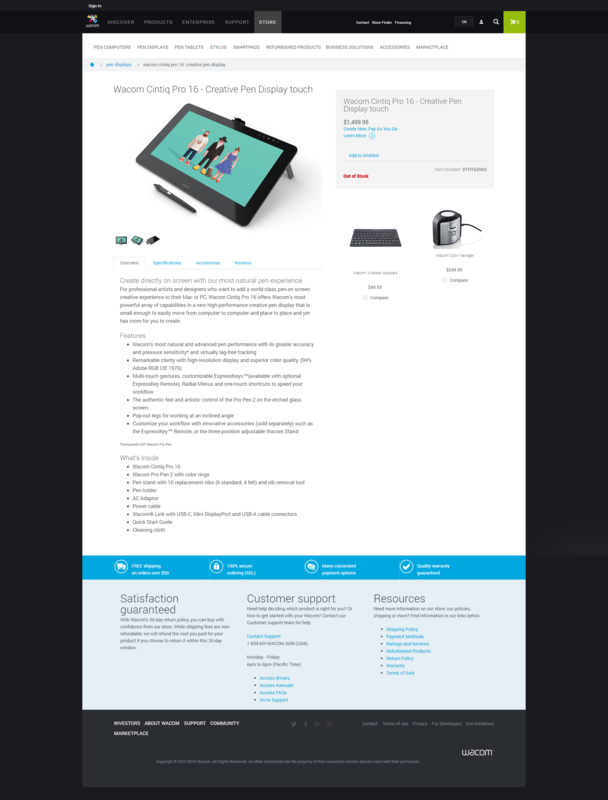 They look exactly the same but the pricing (at least on the Wacom EU website) is different.